Another gloriously enjoyable evening at the RSC in Stratford. 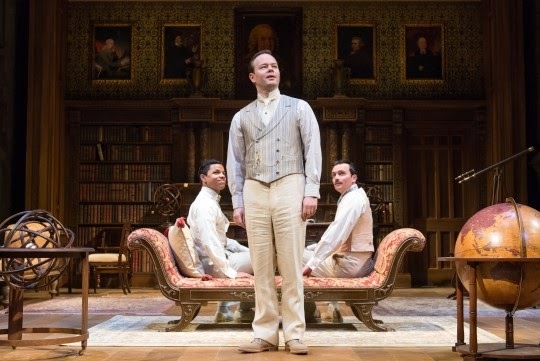 Shakespeare’s setting of Love’s Labour’s Lost in a court in Navarre, has been moved to a country house in England in the period just before the First World War. Inevitably that brings Downton Abbey to mind, but the influences on this production are much wider than that. There’s certainly a bit of Brideshead Revisited and more than a touch of My Fair Lady. The play within a play in the second act is almost Gilbert and Sullivan, the policeman arriving at the country house is Agatha Christie-ish (as is the vicar),and the gardener Costard seems to be closely modelled on Compo from Last of the Summer Wine. The ending in a big musical number even seems to be have a tinge of Les Miserables. But out of these varied influences, the Director Christopher Luscombe and his team have created something special. The play is beautifully designed by Simon Higlett, with a wonderful set closely based on Charlecote Park, close to Stratford. The interior of the house slides back to convert into an exterior bowling lawn, and a rooftop setting rises from below. The costumes are a delight, and looking down on the set from the side of the upper balcony, it’s clear that the positioning of the actors in every scene has been carefully thought through from a design perspective as well as a dramatic one. The music by Nigel Hess adds greatly to the enjoyment, both in set piece songs and dances and in occasional incidental music, although the musicians are mostly hidden away. The cast too is uniformly impressive, from Edward Bennett and Michele Terry as Berowne and Rosaline, through to John Hodgkinson and Peter McGovern as Don Armado and Moth. The rooftop scene where the four men catch each other out writing poems to their loves works wonderfully, the Russian dance in the Second Act is a riot, as is the performance of the Nine Worthies, and the conclusion, where the men, having been told they must wait a year, then re-appear in World War I uniform and march off, made perfect sense and added real poignancy. 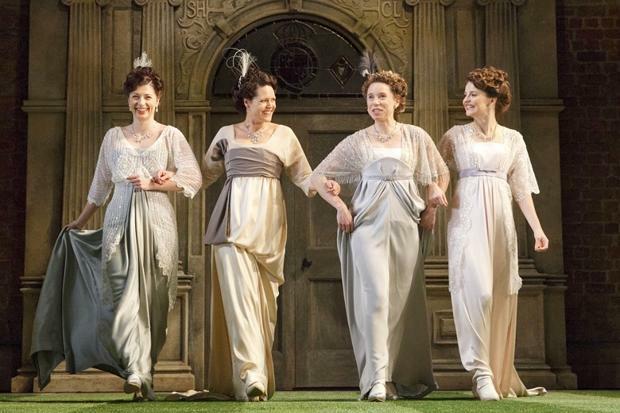 The RSC is pairing the play with Much Ado about Nothing, rebadged as Love’s Labour’s Won and set after World War I with the same cast. If it’s anything like as good as this, it will be well worth the trip. Posted on November 16, 2014, in Theatre and tagged Christopher Luscombe, Edward Bennett, RSC, Simon Higlett, Stratford. Bookmark the permalink. 2 Comments.